In this week’s roundup: How the neo-Nazis heard Trump’s comments, the news that Hitler is definitely dead and a rundown of hate crimes across the country. During an immigration roundtable with California law enforcement officials last week, President Donald Trump made a fairly remarkable comment. We have people coming into the country, or trying to come in – and we’re stopping a lot of them – but we’re taking people out of the country. You wouldn’t believe how bad these people are. These aren’t people. These are animals. And we’re taking them out of the country at a level and at a rate that’s never happened before. While Trump was wrong about the rate of deportations, which are down 50 percent from five years ago under President Barack Obama, his denial of the fundamental humanity of some immigrants drew significant criticism. A few days later, the White House put out a statement doubling down on Trump’s rhetoric, but insisted he was only talking about members of the violent Central American gang MS-13. Even so, that distinction was not what some white supremacists heard. As part of our regular reporting, we often listen to popular alt-right podcasts, paying special attention to how the president is influencing the movement. On the influential neo-Nazi podcast “Fash the Nation,” hosts going by the pseudonyms Jazzhands McFeels and Ethnar said Trump was at least implicating all undocumented immigrants with his comments. 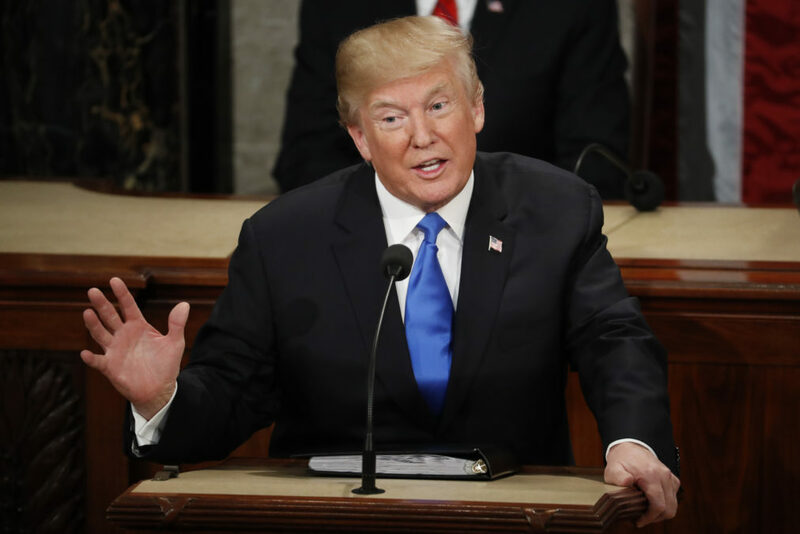 They felt Trump’s talk, which he reiterated during a speech on Long Island, New York, Wednesday, dovetailed precisely with their own broadly xenophobic, anti-immigrant views. The hosts insisted that, by talking about MS-13, the president was helping spread fear about all immigrants. Representatives from the White House did not respond to a request for comment. Earlier this year, a study found hate crimes against Muslims spiked in the immediate aftermath of Trump’s tweets about Islam. 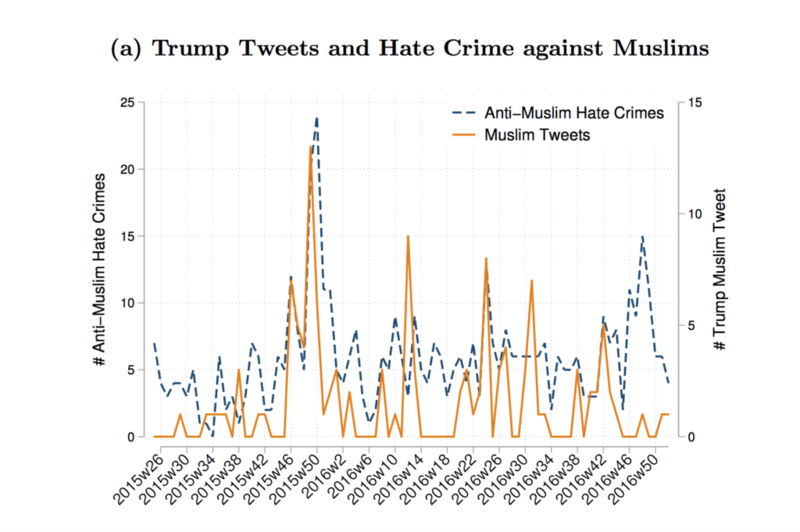 The study’s authors compared the timing of Trump’s tweets about Muslims with daily rates of hate crimes. They found Trump’s tweets predicted increases in anti-Muslim hate crimes that occurred in the following days. The study found these spikes in hate crimes occurred exclusively in counties with high rates of Twitter usage. It also noted that other potential reasons for increases in violence, like local crime rates or the demographic makeup of the areas where these crimes occurred, could not explain these surges of hate-based violence. “The evidence we provide in the paper indicates that with the start of Trump’s presidential run, Twitter might have begun to play a role in the propagation of hateful sentiments,” co-author Carlo Schwarz told us in an email. The authors note this paper has not yet been peer-reviewed by an academic journal. However, its findings do track closely with another paper they released this year showing anti-refugee sentiment coming from the Facebook page of Germany’s far-right Alternative für Deutschland political party predicted violent crimes in German communities with high rates of social media usage. Last month, we published a story showing scores and scores of hate incidents in which the perpetrators invoked Trump’s name and campaign slogans. The Minnesota chapter of the Council on American-Islamic Relations is calling on authorities to investigate the possible bullying of a Muslim teen who committed suicide last month. Jacob Letourneau-Elsharkawy, who was 15 when he took his own life, was allegedly repeatedly called a terrorist and other slurs due to his family heritage. His family alleges he also suffered a broken collarbone and contusions after one bullying incident. Florida resident Dustin Hughes, who was arrested this month for making several threatening calls to his local mosque, recently posted a Confederate flag on his Facebook profile, the Miami New Times reported this week. Hughes allegedly told prosecutors he wanted to scare members of the mosque. Aaron Salazar, a 22-year-old student, remains in a coma after he was found unconscious near railroad tracks in Truckee, California. Salazar’s parents believe that he was targeted in a hate crime because he is gay. Hours before he was found, Salazar had texted a family member to say he had met a friend. His family claims he suffered vicious injuries to his groin area. A woman in Turlock, California, was allegedly punched in the face by a man who had made an anti-Mexican slur against her moments before. Police are investigating the attack as a hate crime. A man in Galesburg, Illinois, was arrested and charged with several counts, including two felony hate crime charges, after allegedly driving his truck into a car driven by an African American woman. Bradley J. Qualls, 37, repeatedly shouted racist slurs at the woman, according to an off-duty cop who witnessed the incident. A father and son in Manassas, Virginia, were charged with a hate crime after allegedly assaulting a man of Middle Eastern origin. The two men are accused of telling the victim to “go back to your country” during the assault. Adolf Hitler isn’t living on the moon. Or in Argentina. Or on Netflix. Contrary to several conspiracy theories, the German dictator did, indeed, shoot himself in a bunker in Berlin, French researchers concluded this week. Last year, a team of French researchers persuaded the Russian government to let them inspect the last two bits of Hitler known to exist: a bullet-shot chunk of skull and a set of frankly disgusting teeth. They compared these fragments to war-era autopsy records and concluded that, yep, those are definitely Hitler’s teeth. “There is no possible doubt. Our study proves that Hitler died in 1945,” co-author Philippe Charlier told Agence France-Presse after the paper published Friday in the European Journal of Internal Medicine. Help Wanted: Have you experienced harassment in online gaming? In past issues of the Hate Report, we’ve looked into how online gaming platforms have become hives for hate-based extremism. Now, we want to learn more about how that hate is manifesting in harassment of users. Have you been a victim of racist, sexist or other types of hate-related harassment while gaming online? If so, we want to hear your stories. Please send us an email if you want to talk. Earlier this year, a study found hate crimes against Muslims spiked in the immediate aftermath of Trump’s tweets about Islam. The study’s authors compared the timing of Trump’s tweets about Muslims with daily rates of hate crimes. They found Trump’s tweets predicted increases in anti-Muslim hate crimes that occurred in the following days. This chart from the authors lays it out:The study found these spikes in hate crimes occurred exclusively in counties with high rates of Twitter usage. It also noted that other potential reasons for increases in violence, like local crime rates or the demographic makeup of the areas where these crimes occurred, could not explain these surges of hate-based violence. The Minnesota chapter of the Council on American-Islamic Relations is calling on authorities to investigate the possible bullying of a Muslim teen who committed suicide last month. Jacob Letourneau-Elsharkawy, who was 15 when he took his own life, was allegedly repeatedly called a terrorist and other slurs due to his family heritage. His family alleges he also suffered a broken collarbone and contusions after one bullying incident. Florida resident Dustin Hughes, who was arrested this month for making several threatening calls to his local mosque, recently posted a Confederate flag on his Facebook profile, the Miami New Times reported this week. Hughes allegedly told prosecutors he wanted to scare members of the mosque. Aaron Salazar, a 22-year-old student, remains in a coma after he was found unconscious near railroad tracks in Truckee, California. Salazar’s parents believe that he was targeted in a hate crime because he is gay. Hours before he was found, Salazar had texted a family member to say he had met a friend. His family claims he suffered vicious injuries to his groin area. A woman in Turlock, California, was allegedly punched in the face by a man who had made an anti-Mexican slur against her moments before. Police are investigating the attack as a hate crime. A man in Galesburg, Illinois, was arrested and charged with several counts, including two felony hate crime charges, after allegedly driving his truck into a car driven by an African American woman. Bradley J. Qualls, 37, repeatedly shouted racist slurs at the woman, according to an off-duty cop who witnessed the incident. A father and son in Manassas, Virginia, were charged with a hate crime after allegedly assaulting a man of Middle Eastern origin. The two men are accused of telling the victim to “go back to your country” during the assault.